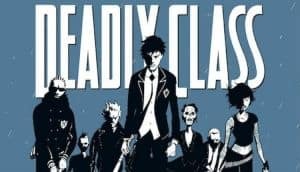 Deadly Class Series Produced by Russo Brothers | Nerd Much? The Russo brothers are a hot commodity in Hollywood right now. The duo are helming some of the biggest properties to hit the big screen, including next week’s Avengers: Infinity War. But the team have another project headed to the small screen too. Syfy has picked up the brothers’ adaptation of the Deadly Class comic. The property originates from an Image Comics series that began in 2014. The label is still publishing Deadly Class comics, with 30 issues released to date. The books follow the story of Marcus Lopez as he adapts from a life on the streets to his enrollment at a school for the development of assassins. The school, headed by Master Lin, consists of children related to murders, mob bosses, and just generally bad people. Marcus’ parents died in a car accident when he was at a young age. Life was nothing but an uphill battle for him following that tragic moment.After his inadequate treatment at an orphanage, Marcus committed an act of gross violence in the story. That act eventually led to his admission to King’s Dominion Atelier of the Deadly Arts in San Francisco. The series was created and written by Rick Remender. Art for the books is handled by Wesley Craig. Syfy announced that they were ordering a pilot for the show last year. Joe and Anthony Russo will serve as executive producers for the series. They are joined in the guiding role by Remender, Miles Orion Feldsott and Mike Larocca. Casting has already taken place following the pilot’s order. Benedict Wong (Doctor Strange) is attached to star alongside Benjamin Wadsworth, Lana Condor, Maria Gabriela de Faria, Luke Tennie, Liam James, and Michel Duval. Syfy hasn’t cited when we can expect the series to premiere on their network. The Russo brothers certainly have their hands full currently as they are helming the untitled Avengers 4 movie scheduled for next May.